"CPIM" redirects here. For other uses, see CPIM (disambiguation). Not to be confused with Communist Party of India. The Communist Party of India (Marxist) (abbreviated CPI(M) or CPM) is a communist party in India. The party emerged from a split from the Communist Party of India in 1964. The CPI(M) was formed at the Seventh Congress of the Communist Party of India held in Calcutta from 31 October to 7 November 1964. The strength of CPI(M) is concentrated in the states of Kerala, West Bengal and Tripura. As of 2016, CPI(M) is leading the state governments in Tripura and Kerala. It also leads the West Bengal Left Front. As of 2014, CPI(M) claimed to have 10,48,678 members. The highest body of the party is the Politburo. 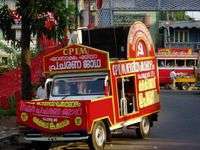 CPI(M) emerged from a division within the Communist Party of India (CPI). The undivided CPI had experienced a period of upsurge during the years following the Second World War. The CPI led armed rebellions in Telangana, Tripura, and Kerala. However, it soon abandoned the strategy of armed revolution in favour of working within the parliamentary framework. In 1950 B. T. Ranadive, the CPI general secretary and a prominent representative of the radical sector inside the party, was demoted on grounds of left-adventurism. Under the government of the Indian National Congress party of Jawaharlal Nehru, independent India developed close relations and a strategic partnership with the Soviet Union (U.S.S.R.). The Soviet government consequently wished that the Indian communists moderate their criticism towards the Indian state and assume a supportive role towards the Congress governments. However, large sections of the CPI claimed that India remained a semi-feudal country, and that class struggle could not be put on the back-burner for the sake of guarding the interests of Soviet trade and foreign policy. Moreover, the Indian National Congress appeared to be generally hostile towards political competition. In 1959 the central government intervened to impose President's Rule in Kerala, toppling the E.M.S. Namboodiripad cabinet (the sole non-Congress state government in the country). Simultaneously, the relations between the Communist Party of the Soviet Union and the Communist Party of China soured. In the early 1960s the Communist Party of China began criticising the CPSU of turning revisionist and of deviating from the path of Marxism–Leninism. Sino-Indian relations also deteriorated, as border disputes between the two countries erupted into the Sino-Indian War of 1962. During the war with China, a faction of the Indian Communists backed the position of the Indian government, while other sections of the party claimed that it was a conflict between a socialist and a capitalist state. The basis of difference in opinion between the two factions in CPI was ideological – about the assessment of Indian scenario and the development of a party programme. This difference in opinion was also a reflection of a similar difference at international level on ideology between the Soviet and Chinese parties. The alleged 'right wing' inside the party followed the Soviet path and put forward the idea of joining hands with the then ruling party – Indian National Congress. Whereas the faction of CPI which later became CPI(M) referred to this as a revisionist approach of class collaboration. It was this ideological difference which later intensified, coupled with the Soviet-Chinese split at the international level and ultimately gave birth to CPI(M). Hundreds of CPI leaders, accused of being pro-Chinese, were imprisoned. Thousands of Communists were detained without trial. Those targeted by the state accused the pro-Soviet leadership of the CPI of conspiring with the Congress government to ensure their own hegemony over the control of the party. In 1962 Ajoy Ghosh, the general secretary of the CPI, died. After his death, S.A. Dange was installed as the party chairman (a new position) and E.M.S. Namboodiripad as general secretary. This was an attempt to achieve a compromise. Dange represented the rightist faction of the party and E.M.S. the leftist faction. At a CPI National Council meeting held on 11 April 1964, 32 Council members walked out in protest, accusing Dange and his followers of "anti-unity and anti-Communist policies". The leftist section, to which the 32 National Council members belonged, organised a convention in Tenali, Andhra Pradesh 7 to 11 July. In this convention the issues of the internal disputes in the party were discussed. 146 delegates, claiming to represent 100,000 CPI members, took part in the proceedings. The convention decided to convene the 7th Party Congress of CPI in Calcutta later the same year. Marking a difference from the Dangeite sector of CPI, the Tenali convention was marked by the display of a large portrait of the Chinese Communist leader Mao Zedong. At the Tenali convention a Bengal-based pro-Chinese group, representing one of the most radical streams of the CPI left wing, presented a draft programme proposal of their own. These radicals criticised the draft programme proposal prepared by M. Basavapunniah for undermining class struggle and failing to take a clear pro-Chinese position in the ideological conflict between the CPSU and CPC. After the Tenali convention the CPI left wing organised party district and state conferences. In West Bengal, a few of these meetings became battlegrounds between the most radical elements and the more moderate leadership. At the Calcutta Party District Conference an alternative draft programme was presented to the leadership by Parimal Das Gupta (a leading figure amongst far-left intellectuals in the party). Another alternative proposal was brought forward to the Calcutta Party District Conference by Aziz ul Haq, but Haq was initially banned from presenting it by the conference organisers. At the Calcutta Party District Conference 42 delegates opposed M. Basavapunniah's official draft programme proposal. At the Siliguri Party District Conference, the main draft proposal for a party programme was accepted, but with some additional points suggested by the far-left North Bengal cadre Charu Majumdar. However, Harekrishna Konar (representing the leadership of the CPI left wing) forbade the raising of the slogan Mao Tse-Tung Zindabad (Long live Mao Tse-Tung) at the conference. Parimal Das Gupta's document was also presented to the leadership at the West Bengal State Conference of the CPI leftwing. Das Gupta and a few other spoke at the conference, demanding the party ought to adopt the class analysis of the Indian state of the 1951 CPI conference. His proposal was, however, voted down. The Calcutta Congress was held between 31 October and 7 November, at Tyagraja Hall in southern Calcutta. Simultaneously, the Dange group convened a Party Congress of CPI in Bombay. Thus, the CPI divided into two separate parties. The group which assembled in Calcutta would later adopt the name 'Communist Party of India (Marxist)', to differentiate themselves from the Dange group. The CPI(M) also adopted its own political programme. P. Sundarayya was elected general secretary of the party. In total 422 delegates took part in the Calcutta Congress. CPI(M) claimed that they represented 104,421 CPI members, 60% of the total party membership. At the Calcutta conference the party adopted a class analysis of the character of the Indian state, that claimed the Indian bourgeoisie was increasingly collaborating with imperialism. Parimal Das Gupta's alternative draft programme was not circulated at the Calcutta conference. However, Souren Basu, a delegate from the far-left stronghold Darjeeling, spoke at the conference asking why no portrait had been raised of Mao Tse-Tung along the portraits of other communist stalwarts. His intervention met with huge applauses from the delegates of the conference . CPI(M) is officially known as भारत की कम्युनिस्ट पार्टी मार्क्सवादी(Bharat ki Kamyunist Party Marksvadi) in Hindi, but it is often known as मार्क्सवादी कम्युनिस्ट पार्टी (Marksvadi Kamyunist Party, abbreviated MaKaPa) in press and media circles. During its initial years after the split, the party was often referred by different names such as 'Left Communist Party' or 'Communist Party of India (Left)'. The party has used the name 'Left' because CPI people were dubbed as rightist in nature for their support to Congress-Nehru regime. During Kerala Legislative Assembly elections of 1965 the party has adopted the name 'Communist Party of India (Marxist)' to obtain its election symbol from the Election Commission of India. AKG Bhavan, the CPI(M) national headquarters in Delhi 28°37′53.6″N 77°12′17.9″E﻿ / ﻿28.631556°N 77.204972°E﻿ / 28.631556; 77.204972. Campaign vehicle in Ernakulam, Kerala. 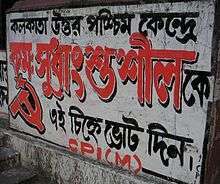 Bengali mural for the CPI(M) candidate in the Kolkata North West constituency in the 2004 Lok Sabha election, Sudhangshu Seal. 18th CPI(M) West Bengal state conference mural. The CPI (M) was born into a hostile political climate. At the time of the holding of its Calcutta Congress, large sections of its leaders and cadres were jailed without trial. Again on 29–30 December, over a thousand CPI (M) cadres were arrested and detained, and held in jail without trial. In 1965 new waves of arrests of CPI(M) cadres took place in West Bengal, as the party launched agitations against the rise in fares in the Calcutta Tramways and against the then prevailing food crisis. Statewide general strikes and hartals were observed on 5 August 1965, 10–11 March 1966 and 6 April 1966. The March 1966 general strike results in several deaths in confrontations with police forces. Also in Kerala, mass arrests of CPI(M) cadres were carried out during 1965. In Bihar, the party called for a Bandh (general strike) in Patna on 9 August 1965 in protest against the Congress state government. During the strike, police resorted to violent actions against the organisers of the strike. The strike was followed by agitations in other parts of the state. 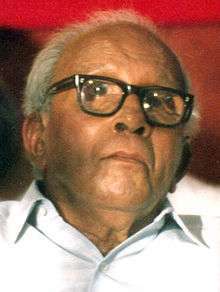 P. Sundaraiah, after being released from jail, spent the period of September 1965 – February 1966 in Moscow for medical treatment. In Moscow he also held talks with the CPSU. The Central Committee of CPI(M) held its first meeting on 12–19 June 1966. The reason for delaying the holding of a regular CC meeting was the fact that several of the persons elected as CC members at the Calcutta Congress were jailed at the time. A CC meeting had been scheduled to have been held in Trichur during the last days of 1964, but had been cancelled due to the wave of arrests against the party. The meeting discussed tactics for electoral alliances, and concluded that the party should seek to form a broad electoral alliances with all non-reactionary opposition parties in West Bengal (i.e. all parties except Jan Sangh and Swatantra Party). This decision was strongly criticised by the Communist Party of China, the Party of Labour of Albania, the Communist Party of New Zealand and the radicals within the party itself. The line was changed at a National Council meeting in Jullunder in October 1966, where it was decided that the party should only form alliances with selected left parties. At this point the party stood at crossroads. There were radical sections of the party who were wary of the increasing parliamentary focus of the party leadership, especially after the electoral victories in West Bengal and Kerala. Developments in China also affected the situation inside the party. In West Bengal two separate internal dissident tendencies emerged, which both could be identified as supporting the Chinese line. In 1967 a peasant uprising broke out in Naxalbari, in northern West Bengal. The insurgency was led by hardline district-level CPI(M) leaders Charu Majumdar and Kanu Sanyal. The hardliners within CPI(M) saw the Naxalbari uprising as the spark that would ignite the Indian revolution. The Communist Party of China hailed the Naxalbari movement, causing an abrupt break in CPI(M)-CPC relations. The Naxalbari movement was violently repressed by the West Bengal government, of which CPI(M) was a major partner. Within the party, the hardliners rallied around an All India Coordination Committee of Communist Revolutionaries. Following the 1968 Burdwan plenum of CPI(M) (held on 5–12 April 1968), the AICCCR separated themselves from CPI(M). This split divided the party throughout the country. But notably in West Bengal, which was the centre of the violent radicalist stream, no prominent leading figure left the party. The party and the Naxalites (as the rebels were called) were soon to get into a bloody feud. In Andhra Pradesh another revolt was taking place. There the pro-Naxalbari dissidents had not established any presence. But in the party organisation there were many veterans from the Telangana armed struggle, who rallied against the central party leadership. In Andhra Pradesh the radicals had a strong base even amongst the state-level leadership. The main leader of the radical tendency was T. Nagi Reddy, a member of the state legislative assembly. On 15 June 1968 the leaders of the radical tendency published a press statement outlining the critique of the development of CPI(M). It was signed by T. Nagi Reddy, D.V. Rao, Kolla Venkaiah and Chandra Pulla Reddy. In total around 50% of the party cadres in Andhra Pradesh left the party to form the Andhra Pradesh Coordination Committee of Communist Revolutionaries, under the leadership of T. Nagi Reddy. In November 1967, the West Bengal United Front government was dismissed by the central government. Initially the Indian National Congress formed a minority government led by Prafulla Chandra Ghosh, but that cabinet did not last long. Following the proclamation that the United Front government had been dislodged, a 48-hour hartal was effective throughout the state. After the fall of the Ghosh cabinet, the state was put under President's Rule. CPI(M) launched agitations against the interventions of the central government in West Bengal. The 8th Party Congress of CPI(M) was held in Cochin, Kerala, on 23–29 December 1968. On 25 December 1968, whilst the congress was held, 42 Dalits were burned alive in the Tamil village of Kizhavenmani. The massacre was a retaliation from landlords after Dalit labourers had taken part in a CPI(M)-led agitation for higher wages. The United Front government in Kerala was forced out of office in October 1969, as the CPI, RSP, KTP and Muslim League ministers resigned. E.M.S. Namboodiripad handed in his resignation on 24 October. A coalition government led by CPI leader C. Achutha Menon was formed, with the outside support of the Indian National Congress. Fresh elections were held in West Bengal in 1969. CPI(M) contested 97 seats, and won 80. The party was now the largest in the West Bengal legislative. But with the active support of CPI and the Bangla Congress, Ajoy Mukherjee was returned as Chief Minister of the state. Mukherjee resigned on 16 March 1970, after a pact had been reached between CPI, Bangla Congress and the Indian National Congress against CPI(M). CPI(M) strove to form a new government, instead but the central government put the state under President's Rule. In Kerala, fresh elections were held in 1970. CPI(M) contested 73 seats and won 29. After the election Achutha Menon formed a new ministry, including ministers from the Indian National Congress. In 1971 Bangladesh (formerly East Pakistan) declared its independence from Pakistan. The Pakistani military tried to quell the uprising. India intervened militarily and gave active backing to the Bangladeshi resistance. Millions of Bangladeshi refugees sought shelter in India, especially in West Bengal. At the time the radical sections of the Bangladeshi communist movement were divided into many factions. Whilst the pro-Soviet Communist Party of Bangladesh actively participated in the resistance struggle, the pro-China communist tendency found itself in a peculiar situation as China had sided with Pakistan in the war. In Calcutta, where many Bangladeshi leftists had sought refuge, CPI(M) worked to co-ordinate the efforts to create a new political organisation. In the fall of 1971 three small groups, which were all hosted by the CPI(M), came together to form the Bangladesh Communist Party (Leninist). The new party became the sister party of CPI(M) in Bangladesh. "revolutionary vanguard of the working class of India. Its aim is socialism and communism through the establishment of the state of dictatorship of the proletariat. In all its activities the Party is guided by the philosophy and principles of Marxism–Leninism which shows to the toiling masses the correct way to the ending of exploitation of man by man, their complete emancipation. The Party keeps high the banner of proletarian internationalism". The party is well known for its anti-globalization and anti-capitalist stance. CPI(M) currently has nine MPs in Lok Sabha. CPI(M)'s highest tally was in 2004 when it got 5.66% of votes polled in and it had 43 MPs. It won 42.31% on an average in the 69 seats it contested. It supported the new Indian National Congress-led United Progressive Alliance government, but without becoming a part of it. On 9 July 2008 it formally withdrew support from the UPA government explaining this by differences about the Indo-US nuclear deal and the IAEA Safeguards Agreement in particular. In West Bengal and Tripura it participates in the Left Front. In Kerala the party is part of the Left Democratic Front. In Tamil Nadu it was part of the ruling Democratic Progressive Alliance led by the Dravida Munnetra Kazhagam (DMK). However, it has since withdrawn support. Its members in Great Britain are in the electoral front Unity for Peace and Socialism with the Communist Party of Britain and the British domiciled sections of the Communist Party of Bangladesh and the Communist Party of Greece (KKE). It is standing 13 candidates in the London-wide list section of the London Assembly elections in May 2008. A tableaux in a CPI(M) rally in Kerala, India showing two farmers forming the hammer and sickle, the most famous communist symbol. Since the formation of the party, its membership has been increased from 1,18,683 in 1964 to 10,65,406 in 2013. In 2004, the party claimed a membership of 8,67,763. Following is the list of statewise members of the party as in 2004. The 21st party congress newly inducts Mohammed Salim, Subashini Ali and Hannan Mollah into the Politburo. "No person can hold the position of the General Secretary for more than three full terms. Full term means the period between two Party Congresses. In a special situation, a person who has completed three full terms as General Secretary may be re-elected for a fourth term provided it is so decided by the Central Committee with a three-fourth majority. But in no case can that person be elected again for another term in addition to the fourth term." In Tripura, the Ganamukti Parishad is a major mass organisation amongst the tribal peoples of the state. In Kerala the Adivasi Kshema Samithi, a tribal organisation is controlled by CPI(M). As of 2016, CPI(M) heads the state government in Tripura and Kerala. Manik Sarkar is a chief minister belonging to the party. Pinarayi Vijayan is the chief minister of Kerala. In Tripura, the party has a majority of its own in the state assembly, but governs together with Left Front partners. A large number of parties have been formed as a result of splits from the CPI(M), such as Communist Party of India (Marxist-Leninist), Marxist Communist Party of India, Marxist Coordination Committee in Jharkhand, Janathipathiya Samrakshana Samithy, Communist Marxist Party and BTR-EMS-AKG Janakeeya Vedi in Kerala, Party of Democratic Socialism in West Bengal, Janganotantrik Morcha in Tripura, the Ram Pasla group in Punjab, Odisha Communist Party in Odisha, Marxist party in Tamil Nadu, etc. In the 1967 Lok Sabha elections CPI(M) nominated 59 candidates. In total 19 of them were elected. The party received 6.2 million votes (4.28% of the nationwide vote). By comparison, CPI won 23 seats and got 5.11% of the nationwide vote. In the state legislative elections held simultaneously, the CPI(M) emerged as a major party in Kerala and West Bengal. In Kerala a United Front government led by E.M.S. Namboodiripad was formed. In West Bengal, CPI(M) was the main force behind the United Front government formed. The Chief Ministership was given to Ajoy Mukherjee of the Bangla Congress (a regional splinter group of the Indian National Congress). With the backdrop of the Bangladesh War and the emerging role of Indira Gandhi as a populist national leader, the 1971 election to the Lok Sabha was held. CPI(M) contested 85 seats, and won in 25. In total the party mustered 7510089 votes (5.12% of the national vote). 20 of the seats came from West Bengal (including Somnath Chatterjee, elected from Burdwan), 2 from Kerala (including A.K. Gopalan, elected from Palakkad), 2 from Tripura (Biren Dutta and Dasarath Deb) and 1 from Andhra Pradesh. In the same year, state legislative elections were held in three states; West Bengal, Tamil Nadu and Odisha. In West Bengal CPI(M) had 241 candidates, winning 113 seats. In total the party mustered 4241557 votes (32.86% of the statewide vote). In Tamil Nadu CPI(M) contested 37 seats, but drew blank. The party got 259298 votes (1.65% of the statewide vote). In Odisha the party contested 11 seats, and won in two. The CPI(M) vote in the state was 52785 (1.2% of the statewide vote). In the 1977 Lok Sabha elections, the CPM had fielded its candidates on 53 seats scattred around in 14 states and union territories of India. It won 4.29% of the average votes polled in this election. The party had won 17 seats from West Bengal, 3 from Maharashtra and one each from Orrissa and Punjab. This election was done shortly after the Emergency imposed by the Indira Gandhi and reflected a wide uproar of masses against her draconian rule. A coalition of Opposition parties was formed against the Congress regime, CPI(M) too supported this coalition by not fielding its candidates against the Janta Party. Janta Party coalition did not last much and two years after since its formation India had faced the 1980s Lok Sabha Elections. This election saw an increase in the vote percentage of CPI(M) and the party secured more seats then the previous elections. The Party had contested elections in the 15 states and union territories of India, and fielded its candidates on 64 seats. The party had won 37 seats in total. It won 28 seats in West Bengal, 7 in Kerala, and 2 seats in Tripura. The party emerged out as the whole sole representative of the people of Tripura in this election. In the 1977 election, the CPI(M) gained the majority in the Legislative Assembly of the State of West Bengal, defeating the Congress (I). Jyoti Basu became the chief minister of West Bengal, an office he held until his retirement in 2000. The CPI(M) held the majority in the West Bengal government continuously since 1977, which ended in 2011 election.The party also won in Tripura winning 49 of the 60 seats. It has 3 MLAs in Rajasthan assembly. In Bihar it has an alliance with CPI(ML)L and CPI, it has 1 seat in Andhra Pradesh.In Tamil Nadu it has worked for Dalit causes. Now last assembly election held in Tamil Nadu it wons 10 seats out of 12. In the 2002 Presidential elections, Left Front announced Captain Lakshmi Sehgal as its presidential candidate. Against her was the ruling Bharatiya Janata Party's candidate A. P. J. Abdul Kalam. CPIM's Leadership has announced that in form of Captain Lakshmi, they are fielding an 'Alternative Candidate'. They said that though it is clear that Captain Lakshmi can't be the President of India because of the opposition of BJP led NDA and Indian National Congress to her, but through this Presidential Election Left wants to raise key national issues, and make them heard to the masses. Captain Lakshmi herself had pointed out that this Presidential election reflects the opposition of the Indian Left to the Communal-Secreterian Politics of BJP and solidarity with the religious minorities who have suffered a lot under the National Democratic Alliance's leadership. Captain Lakshmi Sehgal was an Indian Freedom Fighter who served as a Commander in the Indian National Army of Netaji Subhas Chandra Bose. The CPI(M) led coalitions lost the assembly elections in Kerala and West Bengal. In Kerala, CPI(M) led Left Democratic Front coalition with 68 seats lost to Indian National Congress led United Democratic Front's 72 seats in a neck to neck fought assembly elections. In West Bengal, CPI(M) alliance with 62 seats suffered a setback after 34 years of continuous rule, losing to Trinamool Congress alliance's 226 seats. Its Chief Minister candidate who is also an incumbent Chief Minister, Buddhadeb Bhattacharjee also lost from his Jadavpur assembly constituency. CPI(M) leader and former Chief Minister of Kerala, V.S. Achuthanandan has stated in a TV interview that Bengal defeat was "because of the deviation from party policies and because of its anti-peasant line. Though party tried to correct the mistakes, is not effective enough prevent the downturn." Former CPI(M) leader and prominent economist Ashok Mitra pointed out that the reason why Left Front got defeated in West Bengal is, among other things, the present state leaders deviated from communist policies and principles. There is a criticism that Budhadeb and Nirupam Sen were working as Corporate agents and was influenced by Neo-Liberal policies. CAG had earlier stated in its report that by allocating land to TATA at a subsidised rate, West Bengal govt incurred losses to the public exchequer. Former minister and CPI(M) leader Abdur Rezzak Mollah, blamed politburo members Buddhadeb Bhattacharjee and Nirupam Sen for the Left Front debacle in the Bengal assembly elections. Wikileaks documents published in "The Hindu" newspaper revealed that Budhadeb had assured US Diplomats that if CPI(M) refused to approve neo-liberal policies the party would perish. According to media reports Budhadeb rarely attended Politburo meeting. While CPI(M) supported Pranab Mukherjee as presidential candidate in 2012 presidential election, it is in favour of a non-Congress candidate for the post of the Vice-President. Nine CPI(M) candidates were elected in the 2014 Indian general election, as well as two CPI(M)-supported independents. Wikimedia Commons has media related to Communist Party of India (Marxist). ↑ "Yechury set to become next CPI(M) general secretary". The Hindu. 19 April 2015. Retrieved 20 April 2015. ↑ "CPI(M) Office Bearers in Lok Sabha & Rajya Sabha". 9 June 2014. Retrieved 16 December 2014. ↑ "On P.R. Dasmunshi's Statement | Communist Party of India (Marxist)". Cpim.org. 13 November 2007. Retrieved 20 December 2012. ↑ "Communist Party in Kerala". CPI(M). ↑ The bulk of the detainees came from the left wing of the CPI. However, cadres of the Socialist Unity Centre of India and the Workers Party of India were also targeted. Archived 17 October 2007 at the Wayback Machine. ↑ The 32 were P. Sundarayya, M. Basavapunniah, T. Nagi Reddy, M. Hanumantha Rao, D.V. Rao, N. Prasad Rao, G. Bapanayya, E.M.S. Namboodiripad, A.K. Gopalan, A.V. Kunhambu, C.H. Kanaran, E.K. Nayanar, V.S. Achuthanandan Removed, E.K. Imbichibava, Promode Das Gupta, Muzaffar Ahmad, Jyoti Basu, Abdul Halim, Hare Krishna Konar, Saroj Mukherjee, P. Ramamurthi, M.R. Venkataraman, N. Sankariah, K. Ramani, Harkishan Singh Surjeet, Jagjit Singh Lyallpuri, D.S. Tapiala, Bhag Singh, Sheo Kumar Mishra, R.N. Upadhyaya, Mohan Punamiya and R.P. Saraf. Source: Bose, Shanti Shekar; A Brief Note on the Contents of Documents of the Communist Movement in India. Kolkata: 2005, National Book Agency, p. 37. 1 2 Basu, Pradip. Towards Naxalbari (1953–1967) – An Account of Inner-Party Ideological Struggle. Calcutta: Progressive Publishers, 2000. p. 51. ↑ Suniti Kumar Ghosh was a member of the group that presented this alternative draft proposal. His grouping was one of several left tendencies in the Bengali party branch. Basu, Pradip. Towards Naxalbari (1953–1967) – An Account of Inner-Party Ideological Struggle. Calcutta: Progressive Publishers, 2000. p. 32. ↑ Basu, Pradip. Towards Naxalbari (1953–1967) – An Account of Inner-Party Ideological Struggle. Calcutta: Progressive Publishers, 2000. p. 52-54. 1 2 Basu, Pradip. Towards Naxalbari (1953–1967) – An Account of Inner-Party Ideological Struggle. Calcutta: Progressive Publishers, 2000. p. 54. ↑ Basu, Jyoti. Memoirs – A Political Autobiography. Calcutta: National Book Agency, 1999. p. 189. ↑ The jailed members of the new CC, at the time of the Calcutta Congress, were B.T. Ranadive, Muzaffar Ahmed, Hare Krishna Konar and Promode Das Gupta. Source: Bose, Shanti Shekar; A Brief Note on the Contents of Documents of the Communist Movement in India. Kolkata: 2005, National Book Agency, p. 44-5. ↑ M.V.S. Koteswara Rao. Communist Parties and United Front – Experience in Kerala and West Bengal. [Hyderabad, India]: Prajasakti Book House, 2003. p. 234-235. ↑ According to Basu (in Basu, Pradip; Towards Naxalbari (1953–67) : An Account of Inner-Party Ideological Struggle. Calcutta: Progressive Publishers, 2000.) there were two nuclei of radicals in the party organisation in West Bengal. One "theorist" section around Parimal Das Gupta in Calcutta, which wanted to persuade the party leadership to correct revisionist mistakes through inner-party debate, and one "actionist" section led by Charu Majumdar and Kanu Sanyal in North Bengal. The 'actionists' were impatient, and strived to organize armed uprisings. According to Basu, due to the prevailing political climate of youth and student rebellion it was the 'actionists' which came to dominate the new Maoist movement in India, instead of the more theoretically advanced sections. This dichotomy is however rebuffed by followers of the radical stream, for example the CPI(ML) Liberation. ↑ On 1 July People's Daily carried an article titled Spring Thunder Over India, expressing the support of CPC to the Naxalbari rebels. At its meeting in Madurai on 18–27 August 1967, the Central Committee of CPI(M) adopted a resolution titled 'Resolution on Divergent Views Between Our Party and the Communist Party of China on Certain Fundamental Issues of Programme and Policy'. Source: Bose, Shanti Shekar; A Brief Note on the Contents of Documents of the Communist Movement in India. Kolkata: 2005, National Book Agency, p. 46. ↑ This press statement was reproduced in full in the central CPI(M) publication, People's Democracy, on 30 June. P. Sundarayya and M. Basavapunniah, acting on behalf of the Polit Bureau of CPI(M), formulated a response to the statement on 16 June, titled 'Rebuff the Rebels, Uphold Party Unity'. Source: Bose, Shanti Shekar; A Brief Note on the Contents of Documents of the Communist Movement in India. Kolkata: 2005, National Book Agency, p. 48. ↑ Some perceive that the Chinese leadership severely misjudged the actual conditions of different Indian factions at the time, giving their full support to the Majumdar-Sanyal group whilst keeping the Andhra Pradesh radicals (that had a considerable mass following) at distance. ↑ "Untitled-1" (PDF). Retrieved 27 July 2015. ↑ officialwebsite of kerala.gov.inArchived 5 August 2006 at the Wayback Machine. ↑ The same is also true for the Workers Party of Bangladesh, which was formed in 1980 when BCP(L) merged with other groups. Although politically close, WPB can be said to have a more Maoist-oriented profile than CPI(M). ↑ [http://cpim.org/content/party-constitution CPI(M) Constitution] Amended April 2005 at the 27th National Convention, New Delhi, India. Accessed online 11 November 2011. ↑ "CPIM : About Us". CPIM. January 5, 2015. Retrieved June 12, 2015. ↑ Membership figures from https://web.archive.org/web/20080224023939/http://www.cpim.org/pd/2005/0403/04032005_membership.htm. Archived from the original on 24 February 2008. Retrieved 1 January 2008. Missing or empty |title= (help). Electorate numbers taken from http://www.eci.gov.in/SR_KeyHighLights/LS_2004/Vol_I_LS_2004.pdf. Puducherry is counted as part of Tamil Nadu, Chandigarh counted as part of Punjab. ↑ "Leadership". Communist Party of India (Marxist). Retrieved 27 July 2015. ↑ "New Polit Bureau", CPIM website 19 April 2015. ↑ BS Reporter (13 March 2015). "Surya Kanta Mishra replaces Biman Bose as CPI(M) Bengal unit secretary". Retrieved 27 July 2015. ↑ "Members of PB – 7th to 19th Congress | Communist Party of India (Marxist)". Cpim.org. Archived from the original on 25 November 2012. Retrieved 20 December 2012. ↑ "CPI (M) Website". Archived from the original on 24 November 2012. Retrieved 9 October 2012. ↑ "Elections 2013 Tripura". IBN Live. Archived from the original on 27 December 2013. Retrieved 14 December 2013. 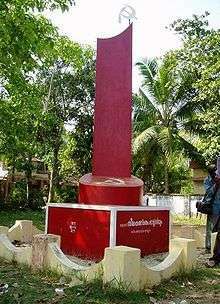 ↑ In Kerala the United Front consisted, at the time of the election, of Communist Party of India (Marxist), the Communist Party of India, the Muslim League, the Revolutionary Socialist Party, the Karshaka Thozhilali Party and the Kerala Socialist Party. "Archived copy". Archived from the original on 5 August 2006. Retrieved 2006-07-26. ↑ ECI: Statistical Report on the 1971 Lok Sabha Election Archived 16 June 2007 at the Wayback Machine. ↑ ECI: Statistical Report on the 1971 Orissa Legislative Election Archived 16 June 2007 at the Wayback Machine., ECI: Statistical Report on the 1971 Tamil Nadu Legislative Election Archived 16 June 2007 at the Wayback Machine., ECI: Statistical Report on the 1971 West Bengal Legislative Election Archived 16 June 2007 at the Wayback Machine. ↑ "1977 general elections ECI Report" (PDF). Retrieved 27 July 2015. ↑ "1980 General Elections ECI Report" (PDF). Retrieved 27 July 2015. ↑ "Left parties to field Lakshmi Sahgal". The Hindu. New Delhi. 15 June 2002. Retrieved 29 June 2012. ↑ "question & answer on the election". cpim.org. ↑ "interview with lakshmi sahgal". cpim.org. ↑ "Live Election Results, Delhi Elections 2015, Assembly Election Live News". www.ndtv.com. Retrieved 27 July 2015. ↑ "With No Apologies". The Telegraph. Calcutta, India. 20 May 2011. ↑ "CPM censures former land minister". The Times of India. ↑ Hiddleston, Sarah (3 April 2011). "West Bengal's pro-business Chief Minister reaches out". The Hindu. Chennai, India. ↑ "CPI(M) favours non-Congress candidate for VP post: Prakash Karat". 12 July 2012.